For architectural beauty, historical significance or popular appeal, they may not rank with St. Peter’s in Rome, Notre Dame in Paris or London’s Westminster Abbey, but hundreds of religious points of interest are just waiting to be discovered by inquisitive travelers not content with merely seeing the usual highlights. Many of us are always on the lookout for those unheralded places, offbeat spots without the crowds. We seek out less obvious shrines, churches or passion plays, especially if we’ve already experienced the more famous ones. Here are 11 places worthy of consideration, all with religious significance and their own story to tell. The little town where the beloved Christmas carol “Silent Night” was first sung will be getting a lot of attention next year as it observes the 150th anniversary of the song’s creation. Oberndorf, located 13 miles north of Salzburg, welcomes visitors year-round to the Silent Night Chapel, built between 1924 and 1937 on the site of St. Nicholas Church, where priest Joseph Mohr and organist Franz Gruber introduced the carol on Christmas Eve of 1818. Gruber, a school teacher, composed the song to a lyric by Mohr, playing his guitar because the organ was broken. Every year at 5 p.m. on Dec. 24 a traditional performance of “Silent Night” is presented in front of the tiny white chapel, whose stained-glass windows depict Mohr and Gruber. Also inside are a copy of the original composition (the original is in the Salzburg Museum) and a Nativity scene. The pink vicarage where Mohr lived has a museum on the song’s history. Balanced precariously on smooth granite pillars towering above the Thessalian plain in the isolated Meteora region, the collection of mysteriously situated mountaintop monasteries dates back to late Byzantine and medieval times. Though seemingly harsh and lonely, the lofty setting was ideal for Eastern Orthodox monks who came to find God, ponder the universe and renounce worldly things. At these dizzying heights, reached by rope ladders and later a pulley system, they certainly must have felt close to heaven. At its zenith during the 16th and 17th centuries, the two-mile-square Meteora community counted 24 monasteries clinging to its perpendicular pinnacles. The six red-tiled-roof refuges that remain today—all are active religious centers and open to tourists—are inhabited by a handful of monks and nuns who serve as guides and curators. These monastic settlements, each built around a central courtyard, are treasure houses of art and architecture, offering museums filled with valuable icons and sacred relics. Frescoes, hanging oil lamps and icons adorn their chapels. 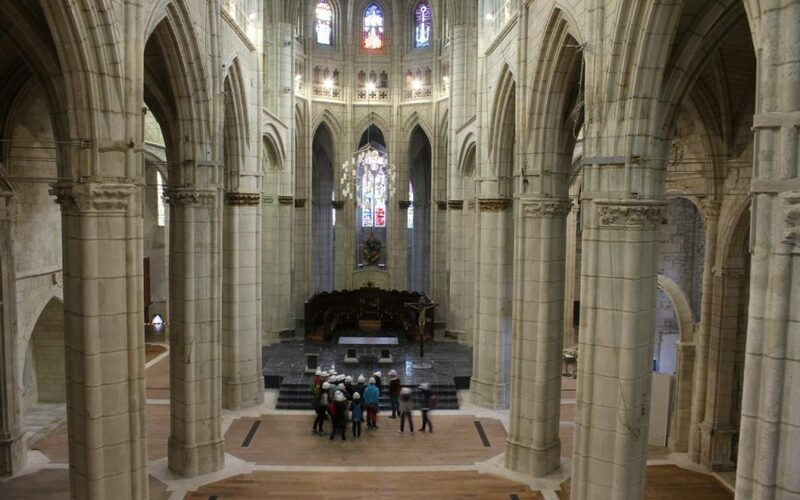 Beautiful churches obscured by scaffolding is a common sight in Europe, but visitors to the capital of Spain’s Basque Country can take advantage of an unusual tour that goes behind the scenes of a major restoration. The Cathedral of St. Mary, dating back to the 11th century, offers hard-hat tours of what basically is a construction site with no finish date in sight. Due to water damage and the shifting subsoil underneath its foundation, the church had been showing cracks in its transept and columns for many years before closing in 1994. The tour provides a look at the intricacies of medieval architecture and how stonemasons and other workers today are tackling structural problems in restoring the church to its former glory. From catwalks, visitors view scaffolding, cranes and men at work. An elevator or staircase takes tour members to the bell tower for panoramic views of Vitoria-Gasteiz and its old city walls. The tour includes a video showing diagrams of the church and what needs to be done to bring it back to health. A museum just opened last year in the church’s crypt, where archaeologists found 2,000 corpses (churches were once graveyards). Corpse replicas, along with coins found on the bodies, are among the exhibits. The Oberammergau Passion Play, a major spectacle staged every 10 years, is certainly the best-known interpretation of Jesus’ last days on earth, but more than 90 towns in 15 countries stage passion plays, according to Christian Utpatel, owner of Terra Lu Travel, a Germany-based church travel specialist (germany4groups.com). In 2018 the village of Sömmersdorf, for example, will portray Christ’s Passion for about 1,900 guests in an open-air theater set in the middle of a forest. (The first performance was in 1933.) Located in the Franconia region of Bavaria, north of Würzburg, Sömmersdorf counts only 600 inhabitants, about two-thirds of whom will be involved in the play, to be performed on summer weekends. 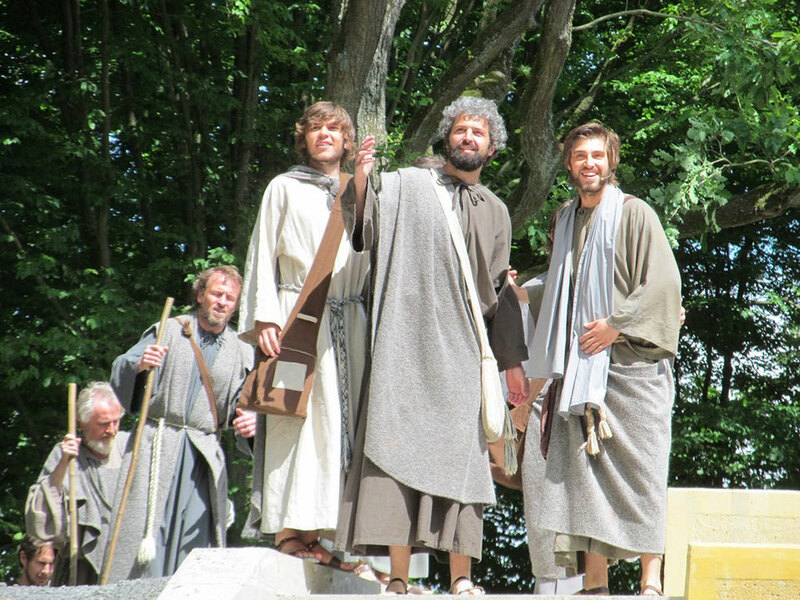 In 2019 about 600 of the 1,450 residents in Erl, Austria will present a passion play for 1,500 visitors on weekends from May to October. Museum Ons’ Lieve Heer Op Solder, better known as Our Lord in the Attic, looks like a typical Amsterdam canal house, but behind the ordinary facade lies a secret church, a place where Catholics could come during a time when the ruling Calvinists forbade them to worship openly. For two centuries, from 1578-1795, Catholics were forced to gather in homes and offices to say Mass in secret. Their lavishly decorated churches were taken over by Protestants and stripped of ornamentation. Built in 1653 in the upper floors of a rich merchant’s home, the former sanctuary is nestled alongside Thai and Indian restaurants in the city’s history-filled Old City. Our Lord in the Attic com-pleted a six-year restoration in 2015 and was officially reopened in the presence of Queen Maxima. The project included new exhibit areas and a new visitor center in an adjacent building. Audio headset-equipped visitors who tackle the narrow stairways can explore two balconies that rise above the long, narrow nave. There is an altar at one end, an organ at the other. In the upper balcony you really get the attic feel. Mass is said several times a year in the church, a museum since 1888. Armagh is a town with roots in Celtic paganism. 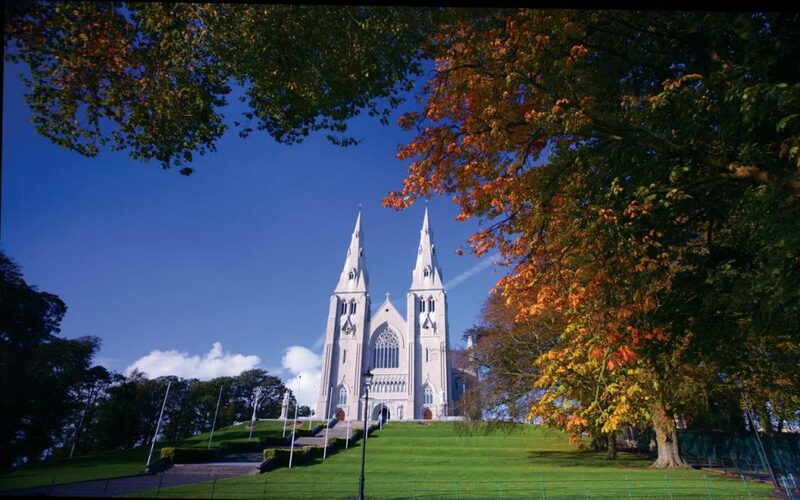 When Christianity spread to the region in the 400s A.D., St. Patrick (Ireland’s patron saint) established his church there and Armagh became the ecclesiastical capital of the island. He decreed that only those educated in Armagh were fit to spread the gospel, so numerous educational institutions were founded. The seat of both Protestant and Catholic archbishops, Armagh (two hours north of Dublin, an hour southwest of Belfast) is the most venerated and oldest of Irish cities. Crowning opposite hills within a half-mile of each other are St. Patrick’s Roman Catholic Cathedral and St. Patrick’s Anglican Cathedral. The 19th century, Gothic-style Anglican (Church of Ireland) cathedral is built on the site of older churches (including the one St. Patrick established in 445, according to tradition) and contains relics of Armagh’s storied past. Buried there is Brian Boru, the King of All Ireland who in 1014 drove the Vikings out of Ireland. The twin-spired French Gothic Catholic cathedral, completed in 1873, is notable for the statues above the main doorway and a magnificent organ. St. Patrick’s Trian Visitor Complex, in a former church behind the tourist office, has exhibits on city history and St. Patrick’s writings. To the east, in the city of Down, visitors can explore the legacy of Ireland’s patron saint through interactive exhibits at the St. Patrick Centre and see his supposed grave in the churchyard at nearby Down Cathedral. St. Patrick’s Trail is a 92-mile signposted driving route that identifies places associated with him in Down and Armagh counties. Though Antwerp is Belgium’s second largest city and an economic powerhouse, it’s not always on the top of travelers’ checklists. Other European cities may have more famous churches, but none of these churches can boast a collection of paintings by Flemish master Peter Paul Rubens. Antwerp’s Cathedral of Our Lady has four Rubens masterpieces. As the centerpiece of Antwerp’s Old Town, the cathedral punctuates the skyline with its 404-foot tower and is practically the symbol of the city. Those willing to climb the tower’s 500 steps are rewarded with views that extend as far as Brussels, 30 miles to the south. Built between 1352 and 1521, the Cathedral of Our Lady is the largest Gothic church in the Low Countries. As you explore its seven aisles, feast your eyes on the architecture and art, which includes Rubens’ The Raising of the Cross, The Descent from the Cross, Assumption of the Virgin and The Resurrection of Christ. The Baroque master is known for his writhing, muscular figures that seem to tumble off the canvas. Behind the cathedral a statue of Rubens stands in the Groen-plaats, a festive square filled with outdoor cafes. Antwerp’s other four monumental churches—St. James’s, St. Andrews, St. Charles Borromeo and St. Paul’s—have works by Rubens or some connec-tion to the artist. Rubens’ burial chapel is in St. James’s. The Rubens House, a reconstruction of his home, studio and garden, is another popular Antwerp attraction. The pilgrimage route that traces the 1522 spiritual journey of St. Ignatius Loyola may be lesser known than the Way of St. James, the trail that leads to the relics of the apostle James in Santiago de Compostela. But it still attracts thousands every year who want to follow in the footsteps of the Jesuit order’s founder, born Inigo Lopez de Loyola to a family of minor nobility in Spain’s Basque region. The Way of St. Ignatius (Camino Ignaciano) begins at the Loyola Sanctuary in the small Basque town of Azpietia, a monumental church complex constructed around the castle-like house where Ignatius Loyola, the youngest of 13 children, was born in 1491. Besides marveling at the impressive domed church sanctuary, visitors can tour the home and see the room where he was born and dioramas depicting important chapters in his life. It was while recuperating from a grave wound suffered in a battle with the French that Ignatius experienced a conversion as he read about the lives of Jesus and the saints. (The room where he lay close to death is now the Chapel of Conversion.) The trail from his birthplace goes through mountains, deserts and plains before ending in Manresa (west of Barcelona), where he lived in caves while com-posing The Spiritual Exercises, a set of prayers and meditations that is considered his masterpiece. Along the route, pilgrims can visit churches where he worshipped. A national shrine and the top tourist sight in Norway’s third largest city, Nidaros Cathedral is where kings in this Lutheran nation are crowned. The largest medieval structure in Scandinavia, it is a magnet for Lutheran and other Protestant pilgrims. The Gothic-style cathedral started as a small Catholic church built over the coffin of King Olav Haraldsson, the Viking credited with uniting Norway into one Christian kingdom. He died in battle about 60 miles from Trondheim in 1030. A year after Olav’s death, his body rose up from the ground. His hair and nails started growing, he smelled like roses and blood seeped from the wounds on his cheeks. Miraculous healings were reported. So, the body was placed on the altar and pilgrims began trekking to Nidaros (the old name for Trondheim) to venerate Olav. Nidaros Cathedral is noted for its magnificent rose window, the largest organ in Scandinavia and sculptures of saints, prophets, kings and bishops adorning its west facade. Adjacent to the church is the Archbishop’s Palace, where a museum displays religious artifacts. The palace’s west wing houses the Norwegian crown jewels. Pilgrims to Trondheim can be accommodated in the Nidaros Pilgrim Centre, a bed-and-breakfast with room for 60 persons. Einsiedeln gained popularity as a religious tourist destination thanks to its Benedictine Abbey, one of the most important pilgrimage sites in Switzerland. Thousands of Catholic pilgrims visit annually to see the statue of the Black Madonna in the abbey’s lavishly decorated, 18th century Baroque church. 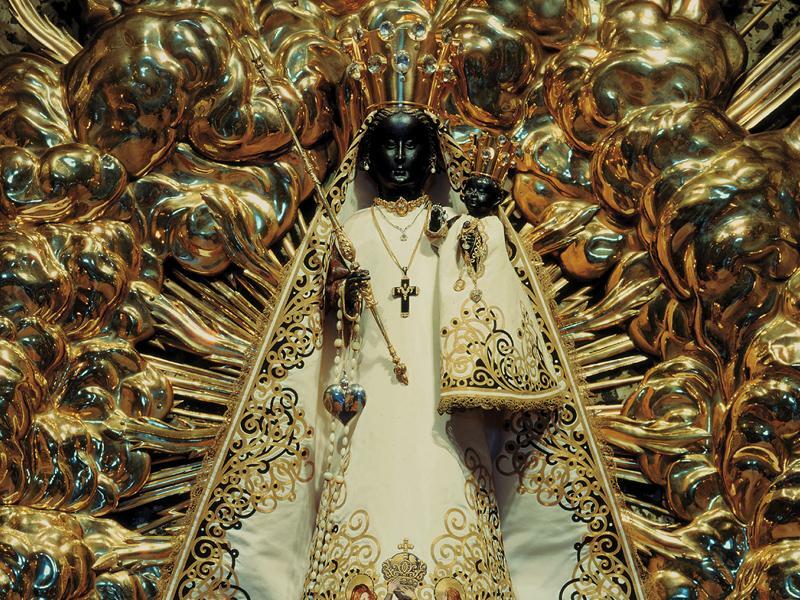 The Einsiedeln Black Madonna image belongs to the series of the famous Black Madonnas of Europe. The Black Madonna became black over the years from dust and the soot of the candles, oil lamps and incense. In 1803 the hands and face were painted black. Monks gather daily at 4:30 p.m. for a church service. Also on visitors’ agendas are Diorama Bethlehem, regarded as the world’s largest Nativity display with 450 hand-carved figures, and Panorama Crucifixion of Christ, a giant circular painting. The town of Einsiedeln, about 25 miles southeast of Zurich, is an important location on the Way of St. James. During the Middle Ages, Einsiedeln was considered the first gathering point for pilgrims traveling to Santiago de Compostela, Spain. Many pilgrims drink from The Lady Fountain, located in the center of the square. The two-room family home of Karol Wojtyla, who later became Pope John Paul II, is a museum filled with photos illustrating all stages of the pontiff ’s life. They include boyhood pictures of him skiing, hiking, playing soccer and taking part in school plays. The future pope, born on May 18, 1920, spent his first 18 years in the simple apartment. The Wadowice tourist office offers a free walking trail map of pope-related sites in the town of 20,000 in the rolling Carpathian foothills southwest of Krakow. In the onion-domed parish church where Karol Wojtyla was baptized, you can see the Chapel of the Virgin Mary, where he prayed as a boy. Tourists are also drawn to the town’s cafes, all of which serve kremowka wadowwicka, a cream cake of which the pope was a big fan. Less than 10 miles from Wadowice lies Kalwaria Zebrzydowska, Poland’s second-most-important pilgrimage site after Jasna Gora monastery in Czestochowa, home of the famous Black Madonna painting.